Infill Lots or Large Acreage? Choosing land development in an urban environment. Jack Butala: Welcome to the Jack Jill show, entertaining, real estate, investment talk, I’m Jack Butala. Jill DeWit: And I am Jill DeWit, broadcasting from sunny southern California. 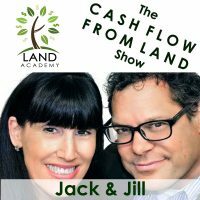 Jack Butala: Today, Jill and I talk about info lots or large acreage, which one, which product type works better for you. Which one makes more money, which one’s easier to deal with, what attracts more buyers. Jill DeWit: What are the differences …. Jack Butala: Yeah, I feel qualified, and I’m sure Jill does too, to answer …. to tell you what we think. It rarely translates …. Jill DeWit: …. sharing your opinion. Jack Butala: Yup, yeah the good thing or good news is that, you know people can turn this show off. Jill DeWit: There’s no wishy washiness about you Jack. You know, there’s no “Gee did he …. what did he mean, was he being sarcastic? Oh no, that was legitimate, if he looks pissed, he probably is”. Jack Butala: There’s a compliment in there somewhere. Jack Butala: Or maybe not, I don’t know we’ll find out in a minute. Jack Butala: Before we get into it, let’s take a question, posted by one of our member’s on the JackJill.com online community, it’s free. Jill DeWit: Okay, Jordan asks “So I recently purchased a parcel of land that …. of Jack’s four A’s, which we’ll cover in a second. Really only has one …. only has acreage, and could be sold for a relatively small amount of money. As I was able to purchase it for very little, but other than that, admittingly doesn’t have much going for it”. 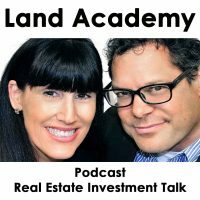 Jack Butala: So my four A’s, before Jill continues her question are: Acreage, every time you look into a property, you check for the four A’s. So does it have acreage? More is better, this is for land only. Does it have affordability? Cheaper’s better. Jill DeWit: That’s number two. Jack Butala: Does it have access? Jill DeWit: That’s number three. Jill DeWit: …. Heavily tree’d. Jack Butala: Yeah, any of those things. Jill DeWit: Some kinds of cool attribute. Jack Butala: Mobile lot, all that stuff so, he checked for his four …. The four A’s and only had one, acreage. Jill DeWit: He chose acreage, well, you know what, I’ma say it technically kinda has two. It’s got acreage and affordability where we’re going with this, so let me …. I’ma continue on. It’s not that I think there’s anything wrong with it per se, it’s not like it’s contained- Contaminated, etc. But it’s basically just desert land, in the middle of nowhere without any apparent amenities, and is landlocked. So I have to assume, that if this appeals to anyone, it will have to be for same reason that it appealed to me. That someone is simply looking to own, a reasonably large chunk of land. Jack Butala: For very little money. Jack Butala: We live this situation. Jill DeWit: …. “Is the neighbor ladder strategy my best bet here, any thoughts from someone who has successfully sold land in this situation would be appreciated, thanks”. Well that, that could be us. Jack Butala: It is us. Jack Butala: Again I feel qualified to answer this question. You have to make a decision, at a really early point, hopefully in your career, about access. Cause I will tell you, property that has no access, when you look at it on a map, there’s just no real way to get to it. Even if it’s just a little two track trail, there’s no way to get to it, but it’s really, really cheap. You have to decide if you want to be in that business or not, no matter what you decide you have to disclose it. You really need to actually shoot it off in a firework in the posting that says “Look, potential buyer, please check access, I do not want you to be disappointed”. Or you need a helicopter to get to it, or whatever you’ve looked into and found you need to disclose it, that’s number one. I will tell you this, there is a massive, and growing market for access-less property. Jill DeWit: I was just gonna say that. Jack Butala: Some of our members, exclusively deal in this type of property. I have never, in my career, in the almost 16,000 deals that we’ve done, purchased a property with no apparent access, and had a problem selling it. Jack Butala: We’ve also really disclosed it and heres why. There are a lot of people, who really want to get lost. Jill DeWit: Be off the grid. Jack Butala: Off the grid, that’s right. Jill DeWit: There’s so much going on, about being off the grid. Jack Butala: If I had a nickel for every seller I’ve ever talked to who’s said “The harder it is to get to it, the more I want to be there”. Jack Butala: They just want to get lost. Jill DeWit: You know what it’s like? Like geo cashing, remember that? For a couple of years ago, that thing that people were doing, like you would go and find the GPS coordinates. And you’d go out in the middle of nowhere and find the treasure, and you would go online and put there that you found the treasure and you replaced it with something else, and that it was like a game. So it’s like that, people want to do that, so. Jack Butala: I’ve never heard of that in my life. Jack Butala: Yeah I guess, per like, yesterday we talked about, I’m just obsessed with other stuff. Jill DeWit: Oh, my brother was into that, and you’d need 4-wheel drive, and a GPS, and they’d be out there doing it, and that was back before our phones would do all that stuff. Jill DeWit: It was really more of an adventure. Jack Butala: There’s a whole subculture, or I guess it’s not even subculture anymore, where people buy property, probably some of it from us, and have a whole YouTube show about how they survive. They’d grow chickens, and vegetables and food, they’re not prepper kooks, they’re people that just are sick and tired of living in a city. They have great internet, satellite internet connection, so they’re totally connected to the world, and you can …. we all know we can make money on the internet from anywhere …. live that lifestyle. That’s who’s gonna buy this property Jordan. Jill DeWit: There are prepper kooks too by the way. Jill DeWit: Not that they’re kooks but you know what I mean. Jack Butala: …. Separate group of members who make it their business to get access to properties like this, so if you buy big piece of property real cheap, and then get easements, and get a road in there, now you got something valuable. Jill DeWit: Well you know what, and the bottom line is that I know, I’m joking about the prepper thing, everybody is …. Here’s the whole thing, prepper’s are awesome and that’s their thing. You know, this is where, you don’t put …. Just because it doesn’t sing to you, doesn’t mean it’s not gonna sing to somebody else. Jill DeWit: …. And it sounds like you do also here, Jordan. You know like, everything that we are using, all these examples and everything that we’re talking about is real. Just because you think “Oh, there’s no access, I’m gonna have trouble selling it”. You know what there’s some like Jack, that’s the whole point of the whole thing. There’s somebody out there, for whatever reason, they want no access, and you don’t want to accidentally sell it to the wrong person. That’s why Jack’s saying be upfront, disclose it and everything, just make sure we go “Hey, this is a tricky one to get to, I hope you have an ATV”. Cause someone’s gonna go “Awesome, that’s what I want”. There you go. Jack Butala: I mean, right in the first chapter of the Ebook, that I write about “The Land Academy”, I have a plaque up there that says “One man’s treasure, is another man’s trash” and that’s just the way it is. Jack Butala: Today’s topic: Along these lines should we buy info lot’s or large acreage, which one’s better for your personality type or your business model, let’s talk about the pro’s and cons. Jack Butala: There’s a woman’s point of view, “which one makes me look better?”. Jill DeWit: …. “Or I look better standing on the small parcel, in the middle of you know Manhattan.”, I don’t know. Jill DeWit: Right, there you go, then you want the large acreage. Jack Butala: This is the[inaudible 00:08:33] show. Jill DeWit: Does this property make me look fat. That’s good dude, thank you very much. Jack Butala: You’re writing that down? Jill DeWit: I am, I’m gonna use that, I need, that’s another one, like my day is a new bacon, I’m gonna say “Does this property make me look fat?”. This is good. Jack Butala: Let’s talk about value and pricing, while Jill’s writing this down. Jack Butala: Less than three lot’s from us, is an info lot that’s worth four million dollars, that’s the size of a postage stamp, it’s just big enough, or small enough, depending on how you look at it, to put a structure on it. And it’s a side lot, next to a property, that a person purchased, its right on the ocean. And it’s worth like I said, probably four million dollars, Jill and I have lots, side, quarter acre properties, all over the south west that are probably worth, 500 to 1500 dollars, much larger. So we’re not talking about dollar amount’s we’re talking about value. Consumer value, or perceived value, so let’s put size aside for a second and let’s talk about use, because that’s what this really centers around. The postage stamp property I just referred to, someone would put a structure on it, and spend four million bucks on the dirt, couple of million dollars on the structure and have an asset that they’ll enjoy. Somebody else, might take a really large parcel like, let’s say, 640 acre’s, which Jill and I have done a lot deals like that. 640 acre’s is a square mile, it’s also called a section, and you can physically visualize, or if you can visualize physically around the perimeter of that, you know you’re gonna drive four miles. It’s a huge, huge piece of property. We’ve regularly done deals where we’ve purchased those for about 40 to 60 thousand dollars, and sell them for 100 to 120, and the person that buys it, is getting a smoking deal. So which would you rather do Jill? A property on the ocean, or a whole section in let’s say, Central California? Jack Butala: Oh my gosh, you just always surprise me. Jack Butala: That’s the best answer. Jack Butala: I thought for sure you’d pick the ocean property. Jill DeWit: That’s hilarious, that’s …. well good I’m glad I surprised you. Jack Butala: You’re the girl for me. Jill DeWit: Thank you, I don’t really have a …. It’s all about the deal, honestly. I really you know, I never really had it like I thought I would. I thought going into this business, that I’m gonna have a natural, like “Oh, I don’t want to sell that one, oh let’s keep it for ourselves”, or whatever like that. Jack Butala: I have that every day. Jill DeWit: I know, isn’t that funny? Jack Butala: Here’s what I’ve learned about people who buy real estate, especially people who buy real estate online. They’re looking for a lifestyle, cause they’re not happy with the one that they have, or they want some type of vacation type release. Where they can take their family two hours’ away, and drive there, put a tent on it, put an RV on it, build a little mobile home or a tiny house or whatever you call it now. But they want some type of story that describes what they’re after like, “Enjoy northern Michigan, during the winter, use it for hunting property, park your RV”. You know …. Jack Butala: So, that’s the story, or that’s like lets call it like the American dream slash they’ll build land ownership dream, with their little, you know little house …. Somebody in the office recently said “It’s little house on the Prairie, that’s what they want”, and it’s exactly what they want. It’s a perfect way to say it, that house with the smoke coming out the stack, with the stream running through it and the whole thing. Jack Butala: So the closer you can get to that for the least amount of money, the more real estate you’re gonna sell. Jack Butala: Yup, and they do. Jill DeWit: Sure! So I roll that in. Jack Butala: You know what, I just saw one just like that. Jack Butala: That just happened, like it’s funny you mentioned …. well maybe you saw the same thing. Jill DeWit: I didn’t, no. Jill DeWit: I didn’t see it go through the closed. Jack Butala: Because, it tells me that you never …. You didn’t …. You looked at it like a line item. Jack Butala: You didn’t look at it for …. And I didn’t because it had tall pine tree’s. I mean really it was on a lake. Jack Butala: …. Because, they went up to look at it. Jill DeWit: Yeah that’s so cool. Now you got two of them. Jack Butala: I think we got five thousand bucks each. Jill DeWit: …. And services, and you know the fire department, and things like that. So I see that as an improvement, you just need to be aware of it and be ready for it, but next thing you know though these people go “Wow, you know what I’m gonna start …. “. They start collecting them, and they do see it as an asset for their family, and a legacy for their kids, and I think it’s awesome. So we have a lot of people that are …. because we mainly are whole sale, where we usually flipping it at those prices, but we don’t …. You don’t have to have a license as a whole seller, there’s no such thing by the way. So anybody can come to us, and get it at whole sale prices. I don’t change my prices, I don’t, I just sell to everybody, and they start to become their own investors. Jill DeWit: And it’s really, really cool. Jack Butala: That’s what happens. Jack Butala: Sneaks up on you. Jill DeWit: …. It does! And it’s great, I mean, and then they feel what we feel, which is at the end of the day, every day I go to bed. And you know Jack and I talked about a couple days ago on a show, the number of properties that are sitting there, in our inventory right now. And I don’t worry about it, I don’t really care, it’s all paid for, I sleep great, I’m not worried that they’re not selling right now or today, or whatever. It’s gonna happen, its totally fine. Jill DeWit: And I know that’s what they think. Jack Butala: It always sells. Jill DeWit: …. Are probably going “You know what this is great, I don’t need to get my money back out of this, we budgeted for this, these are all paid for, and if something happens, now it’s the kids that are gonna get it, it’s gonna be just fine”. Jack Butala: And you know what, this is how men think too. If when you have a piece of dirt like that, there’s just a fall back plan. Jack Butala: Like if some stuff goes wrong, you can always just use that piece of dirt for something, or throw a mobile on there or something. Jill DeWit: I’m glad you said that, cause I think that’s a lot of what people think of too. You brought up the vacation people, you brought up the people that are trying to have a different lifestyle. I do think that especially in our, I don’t know if climate’s the right word, but the way things are with our country, and our world today, I think people want a piece of dirt to have in their back pocket. To know that I have a place to go, should all hell break loose, seriously. Jill DeWit: So, that’s not crazy too, and you can’t do that on a info lot. Jill DeWit: Well you could. Jack Butala: …. You know I was leading up to that. That’s the perfect Segway, info lots are not going to provide that. Jack Butala: …. With info lots. Jack Butala: You got to have a lot more dough, because info lots are a lot more expensive. Jack Butala: But if you’re into; fast deals, spending a bunch of money, and making a bunch of money, commercial like business B to B, not B to C, business to consumer, info lots are for you. But heres some universal truths about both, before Jill jumps in here again. Cheaper’s better, always keep that in your mind, always, and cheap price is relative to whatever is going on immediately around the property, I know that sounds obvious, but people lose sight of that. Jack Butala: Here’s what happens when you get a seller on a line with a house, the first thing they say is “Well yeah, yeah, I understand but, my house has a fantastic X, Y, Z and my son-in-law, he re-did the garage three years ago, he went, he spent all summer here redoing the garage”. Nobody cares, nobody about that at all, so. Jill DeWit: “Have you seen our claw foot tub?” That’s nice. So, but one the things I was gonna say about info lots is, I love them really, because other than a home, they provide more value usually. Usually the one’s we have purchased, we’ve gotten really low, but they’re worth really …. We’ve bought them in a bundle often, with other properties, cause I’m not often seeking out info lots, I’m seeking out, just any acreage, and they just kinda come along with the …. You know, cause one of our conversation question’s is “What else do you have?”, and that’s often where we find these things, and they just roll them into our inventory, roll it into the sale, which is great. Jill DeWit: …. A pool, all this stuff whatever, I don’t have to think about any of that, which is awesome. But I do have to think about other thing’s like, zoning. Let’s all make sure, that’s one big thing, you may think that this info lot, you can do 16 thing’s with, but you wanna make sure …. checks, there’s some, a few extra things you do need to check. Where are you on the utilities? And things like that, what is available there? All those good things. Jack Butala: Well I think that info lots, like mobile home lots, you pretty much know how you’re gonna use it, and if you know how you’re gonna use it. If it’s a pre-determined, either through zoning, or what’s immediately around the property. Now you’re starting down the path toward rational valuation, and that’s good or bad. It’s good if you want to mechanically just make 10, 20, 30 percent on real estate, which is great, I love that by the way. With acreage, it’s more of a feeling, and so you can charge more or less, or if you can paint that realistic Little House on the Prairie scenario. You can hit a home run with acreage that’s my point. You can hit a lot of singles and doubles, but you really can’t hit a home run. We have members who make hundreds of thousands of dollars per deal, with large acreage transactions without putting any money in at all. Jack Butala: Info lots, it’s a little bit less likely, it’s possible, but it’s very less likely. We had a show earlier, I think it was last week, about houses, it’s almost impossible to hit a home run financially with a house. Jack Butala: You can make 40, 50 thousand bucks, maybe on the top end, maybe a little more out west here. Jack Butala: Upwards to a million, but you can’t hit a massive home run, like you really can with a big piece of property and great location. Jill DeWit: …. And it’s worth 2.2 million. Jack Butala: Right, I agree with you completely, but I think you have to renovate it. You have to do something that is gonna make it a little bit better, I just don’t think …. I personally have never purchased a whole sale property and marked it up a million dollars. Jack Butala: Without doing anything at all. Jill DeWit: No, that’s why I’m saying, you can mark it up a hundred thousand dollars without doing anything, cause you bought it right. Jill DeWit: But yeah, you can’t do that much not without doing something to it. Jack Butala: Well you’ve done it again, you spent another 25 minutes listening to the Jack and Jill show. Join us tomorrow, where we discuss our new podcast content ideas, and I’d love to hear from you. Post it on Jack Jill. Jill DeWit: Yeah, and we answer your questions, should you have one, post it on our online community like Jack just said, found on JackJill.com, its free. Jill DeWit: …. New, new content ideas? Jack Butala: Well that’s …. Yeah we do. Jill DeWit: This is gonna be new for me too. Jill DeWit: They tell us what they want to hear? Jack Butala: I’d love for you guys to talk about, you know how you guys work together. Jack Butala: I’d love for you guys to talk about you know, Tennessee as an acquisition situation. Jack Butala: I think it’d be fun. Jack Butala: No I’ll create it, we’ll talk about it tomorrow. Jill DeWit: Oh, okay cool. Jack Butala: I’ll create a real easy spot, where you can just input it. Jill DeWit: Love it. Hey! Jack Butala: I was gonna give you …. Oh, you wanted to be done don’t you? Jill DeWit: No, I was wrapping it up. Jack Butala: I was gonna give you a compliment. Jill DeWit: Well, go ahead I’ll take it, we’ll stop for that, we can always stop for a compliment. Jack Butala: I just love how you don’t see this things …. Properties with any real emotion and I love that you just want to buy it all. You know, you wanna buy the property on the ocean, and you wanna buy the 640 acres up in the woods. Jack Butala: I just think it’s the best attitude possible. Jill DeWit: Thank you, I appreciate that, and I appreciate you. Share the fun, by subscribing to iTunes, or wherever you are listening, and while you’re at it please rate us there. Jack Butala: We are Jack and Jill. Information.